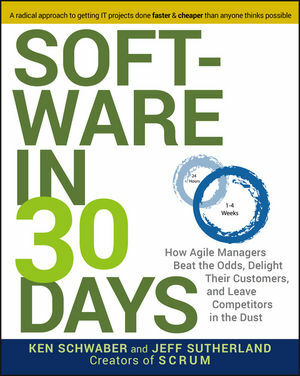 Software in 30 Days is a must-read for all managers and business owners who use software in their organizations or in their products and want to stop the cycle of slow, expensive software development. Programmers will want to buy copies for their managers and their customers so they will know how to collaborate to get the best work possible. JEFF SUTHERLAND is the cocreator of Scrum, and was cosigner of the Agile Manifesto, which marked the start of the Agile movement. He has served as vice president of engineering or CTO at eleven software companies, managing the last seven entirely using Scrum, and achieved industry-leading, hyper-productive results. Jeff is the CEO of Scrum Inc., a consulting and training company. You are probably frustrated with your software organization. You would like it to be quicker, more flexible, understand your needs better, and help you become more profitable. We look at why you are frustrated and how to fix the problem. Many software organizations follow a development process that guarantees waste, uncontrolled risk, unpredictability, surprises, and low value. We will investigate why this process was chosen, how it guarantees failure, and look and some organizations that have recovered from it. There is a process that is appropriate for software development. When you get your developers to use it, you will immediately gain productivity, quality, value, control, predictability, and satisfaction. We look at how this happens in this chapter. You have read our assertion that there is a better way for you to get software developed for you. However, a lot of people have made assertions and taken a lot of your money in the past, with little or no improvement. In this chapter we show you how to prove that our approach works for no money. You learned how to do better and you’ve tried it yourself. You like the results and you know what to tell the software organization to do. In this chapter, we look at what you can do to help what you experience in the pilot project succeed. Having better software developed for your needs is not so much hard as it is different from what you are used to. In this section, we look at a progressively beneficial set of approaches to get you from where you are now to organizational agility. Our secret sauce for improving your benefits from software is called “Scrum.” Yes, this is the rugby event that keeps the ball moving down the field. We’ll discuss Scrum, how it works, and why it works in this chapter. Most persistent improvement in software development starts at the project level. You can use Scrum to further prove its utility, or on critically important initiative that must succeed. We’ll explore what you can tell your developers to do after reading this chapter. Success often breeds success. As more software initiatives using Scrum succeed, more people will want to get on the wagon. Rather than changing the entire organization, let’s look at how we can set up a software development universe separate from the disappointing, existing department. You can increasingly reap benefits here on an increasing number of projects and releases. Scrum at a project or release level provides initiative level agility, the ability to rapidly respond to opportunities or rise to challenges. To gain the most significant benefits, Scrum’s empirical approach to software development must be fit into the organization as a whole. We’ll look at how to do this, and why some approaches are short-lived and others persist. You want to make your organization leaner, more efficient, and agile on your watch. Even more, you want these benefits and their underlying causes to persist and become the organizational culture. We’ll look at an enterprise change approach for achieving this in this chapter. We devised Scrum for complex problem solving, like software development. We found Scrum a useful technique for managing organizational change, also a complex problem. The same benefits of transparency, waste removal, risk control, and predictability occurred. We’ll look at this use of Scrum in this chapter. We slowly and progressively introduced some new terminology. This appendix is your reference for those terms. Read the canonical guide to Scrum, its roles, artifacts, and events. This is the bible of Scrum. This appendix presents a more detailed plan for enterprise change, as discussed in Chapter 10.